The first stage of Canberra’s light rail network will be delivered by a world-class consortium, Canberra Metro, sooner and with a capital cost lower than earlier estimated, ACT Chief Minister Andrew Barr and Minister for Capital Metro Simon Corbell announced today. 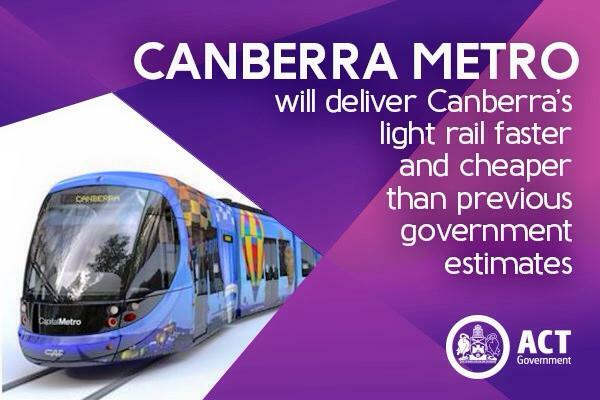 Canberra Metro will construct and operate stage one of Canberra’s light rail from Gungahlin to the City. “Canberra Metro’s proposal offers an innovative and world-class solution that will deliver better transport for Canberra,” Mr Barr said. “The quality and breadth of the bid responses reflects the stature of this project and the appetite of the international infrastructure community to help redefine our city and further improve its liveability. “The first stage of Canberra’s light rail network, the corridor from Gungahlin to City, represents a timely investment in a more convenient, efficient, affordable and reliable integrated transport system – a genuine alternative to driving. Mr Corbell said the winning consortium, comprising of Pacific Partnerships, CPB Contractors, John Holland, Mitsubishi Corporation, Aberdeen Infrastructure Investments, Deutsche Bahn International and CAF has a proven track record of transport construction and operation both within Australia and overseas. “While the final cost will be confirmed when contracts are signed, the capital cost included in the winning bid is $698 million, with a variance of 5 per cent depending on contract negotiations and changes in market conditions between now and contract closure. “Additionally, Canberra Metro will complete construction in late 2018 and begin operations in early 2019. This is sooner than previous estimates and means less disruption for Canberrans and faster access to the transformational effects of this city changing project. “Importantly, as Northbourne Avenue and the Federal Highway are the entry to the national capital, the removal and replacement of trees will be staged to minimise the visual impact. The staged approach will mean that as sections of trees are removed, and replaced with 4m tall plantings, there will only be periods of 3-4 months where each section will be without trees. “Critics of light rail have said that we wouldn’t be able to deliver this project for less than a billion dollars but by selecting a bid that will deliver the project under our projected budget and ahead of our projected timeframes we have proven that our business case was conservative in its estimates. “While the project’s opponents claim that this is the only priority for the ACT Government it is an important but affordable investment for this city’s future. In the context of total ACT Government outlays, this project will account for less than one per cent of the government’s expenditure over the life of the PPP. Over the same period, the ACT Government will outlay 34 times as much on health and 25 times as much on education. The Chief Minister said a decision on a possible extension to Russell will be made this year as discussions continue with the Federal Government. “The Australian Government has shown its commitment to partnering with states and territories to deliver quality transport infrastructure through the Prime Minister’s cities agenda,” Mr Barr said. “This is demonstrated through his investment in stage 2 of the Gold Coast light rail and through the asset recycling initiative. “I met with the Prime Minister late last year and following the meeting he has invited the ACT Government to seek federal funding for the Russell extension. “We see the Russell extension as an excellent example of the Prime Minister’s cities agenda and recognise the Australian Government is a major stakeholder in the project as the largest employer and land holder in the corridor. Mr Corbell said the journey of the past two years reflects the intensive planning and preparation which has resulted in today’s announcement. 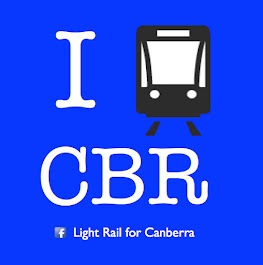 “With more than 220 years of combined experience in systems engineering, light rail operations and maintenance, and providing 2.2 billion passenger journeys each year across 14 countries, Canberra can be confident that the consortium will deliver this transformational project,” Mr Corbell said. “The Public Private Partnership with Canberra Metro will allow the ACT Government to draw upon the expertise and technical infrastructural knowledge of a high class consortium, and support Canberra’s trade, investment and local businesses. “This project will help to stimulate Canberra’s economy through public and private investment, delivering opportunities for new businesses which will also support job opportunities and apprenticeships for locals. Pacific Partnerships, John Holland, Mitsubishi Corporation and Aberdeen Infrastructure Investments bring a strong track record in the investment of equity in infrastructure projects across Australia and internationally. Pacific Partnerships – which develops and invests in infrastructure projects built by CIMIC’s operating companies – and John Holland will also provide operations and maintenance services for 20 years in partnership with Deutsche Bahn International. John Holland and CPB Contractors bring the largest track record of rail delivery in Australia, including major rail infrastructure projects such as Sydney’s Inner West light rail extension, Adelaide’s Coast to Coast light rail project, Melbourne’s Regional Rail Link Project and Queensland’s TrackStar Alliance. Deutsche Bahn brings over 175 years’ experience in transport modelling, integration, systems engineering and world-class excellence in light rail operations and maintenance, with a strong customer focus. Its light rail subsidiary provides 2.2 billion passenger journeys each year across 14 countries. Light rail vehicles will be supplied and maintained by CAF for 20 years. The new Spanish vehicles combine modern aesthetics with state-of-the-art equipment and maximum accessibility, without comprising comfort, performance or ease of operation and maintenance.